James le Palmer (d. 1375) was a London Clerk who, as he tells us in the introduction, consulted over 100 different texts in compiling this vast encyclopaedia of canon law, theology, and general information. James wrote the book himself, which was a huge undertaking: in its present, unfinished form (the encyclopaedia runs out of steam after the letter 'M'), the text runs to well over very 2000 large pages, decorated with over 800 illustrations. The text on this page is a constitution of Pope Benedict XII on the 'Beatific Vision': seeing Christ's face in heaven. 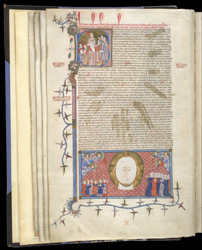 In the historiated initial 'B' Benedict, accompanied by three cardinals wearing red hats, addresses three scholars, wearing black ones. The miniature shows men, women, and angels all adoring the Holy Face.